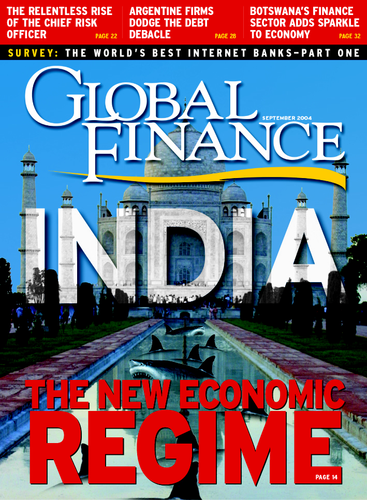 In its attempts to bring investment to India, the country’s new government is facing a host of challenges. If it stays the course, its efforts should pay off. or years, the phenomenon that domestic and global corporations and fund managers worried about most when considering investments in India—even more than its vacillating politicians and avaricious bureaucrats—was the unpredictability of the monsoon and the effect it has on India’s GDP growth.Their concern was hardly surprising: With 25% of India’s GDP and over two thirds of its population being directly dependent on the monsoon, the engine of the economy is fueled by rainwater. 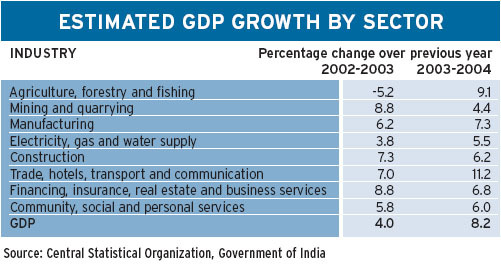 Already GDP growth expectations have been scaled down to 6.5% for fiscal year 2004-2005. But this figure assumes that there will be some agricultural growth. If the agricultural sector shows a negative growth for the year, the overall GDP growth number may have to be scaled down further. The monsoon failure joins a string of unexpected events in 2004, ranging from the electoral defeat of the pro-reform NDA government to potential reversals on privatization, electricity and banking reforms—and promises of increased subsidies from a left-leaning government. While these developments rattled stock market investors, things are not as bleak as they appear.Within the ruling alliance there is no fundamental objection to continuing with the reform process, for example.“It is the pace of reforms which has changed and not the direction, and so far there has been no loss of confidence among investors,”says Ajit Ranade,group chief economist at the diversified industrial giant Aditya Birla Management Corporation.While the monsoon has an indirect impact on industrial demand, there are several mitigating factors. Both the industry and services sectors, which make up 75% of GDP, have proven to be very resilient and in recent years have shown strong growth even when monsoons have been poor. In 2002-2003, for example, India suffered the worst drought in 15 years, but GDP still grew by 4%, despite a 5.2% shrinkage in the agricultural sector. In fact, as India’s economy modernizes, the impact of the monsoon is diminishing significantly. The failure of this year’s monsoon might throw macro calculations off for the next year, but it does not mean that foreign investment interest will decline. In sectors such as telecom, banking, insurance, IT-enabled services, petroleum and auto ancillaries, there has been a deluge of foreign investments.Recently,Singapore Technologies and Malaysia Telekom announced they would invest $220 million for a 33% stake in IDEA Cellular, India’s fifth-largest cellular company, the latest example of big-ticket investments in the Indian services sector. “Thanks to a robust manufacturing and years to reach $60 billion a year.This year has been even better: During the first two months of fiscal 2004-2005, exports grew by 25% over the same period last year. Export performance has been so buoyant that India has been running a current account surplus for the past three consecutive years, which, according to the Reserve Bank of India, reached an all-time high of 1.4% of GDP. services sector, the economy can safely grow at 6.5% even with a poor monsoon, and this growth rate is above the long-term trend-line growth,” says Ranade. Potential investors are also reassured by the fact that India’s economy is becoming increasingly export driven, as companies achieve the scale and confidence to expand into new markets. For example, from a base of almost zero a few years ago, the automobile sector, including ancillaries, now exports $3.5 billion worth of vehicles and components.The petroleum sector has seen similar growth: Now it exports $3 billion worth of value-added products annually, including motor and aviation fuel.The IT sector has gone from a few hundred million dollars of exports in the mid-1990s to $10 billion in exports for 2003-2004. Figures like these have helped India achieve 17% compound annual growth in exports for the past two consecutive stake in power company NTPC. But the government’s communist allies,backed by the trade unions, want these rescinded and further restrictions imposed on foreign investment. Undeterred, the government is sticking to its revised $15 billion annual FDI target—although it does not acknowledge that against the current target of $10 billion India received just $5 billion last year. As yet, India does not have a clear plan for how it will achieve these figures, but it still wants to match the kind of capital flows received by China in recent years. “FDI can be used as a tool for growth, especially as India needs investment in new capacities. India offers great opportunity with skilled labor besides having a large domestic market,”says Vyas. While the hurdle of political opposition can be easily overcome, the government’s FDI policy is still very cumbersome and desperately needs streamlining. “We have to create a climate to attract investment. We need to reduce the in-vestors’ points of contact with the bureaucracy, streamline the current requirements of multiple approvals, introduce a uniform FDI policy and not the sectoral kind that we have now, and introduce fiscal competition between states to attract investments,”says Ranade.Even in Mumbai, India’s financial capital, an investor setting up a call center operation needs 15 different sets of approvals from various local and state government bodies,underscoring the kind of bureaucracy that even controls sectors that are relatively uncomplicated to set up and run. Both FDI and portfolio investments are linked to overall investor confidence in the system—not just political, but infrastructural as well. If the system and the environment are unstable or too cumbersome, then investments may not be so forthcoming. Foreign portfolio flows, though less stable, were robust last year and amounted to $11 billion—the highest ever inflow since India opened up its stock markets in 1995.With less favorable conditions prevailing this year, few are expecting to see similar inflows.The key factor that brought in last year’s bumper investment harvest was strong anticipated GDP growth.“There were several factors that drove GDP growth last year, which will be difficult to sustain in the current year. We had a confluence of favorable factors, such as low interest rates, low inflation, high business confidence and a great monsoon,” Ranade remarks. The government knows well that faster GDP growth is critical to sustaining foreign investments, and its target is 7% to 8% growth for the next few years. This will be difficult to achieve without significant structural reforms. “Sustainable higher growth is a challenge now. What we need is a combination of reform plus infrastructure creation,” says Ranade. ates taxes for the local and state governments concerned.This has gradually led to an institutionalized mechanism for corruption, delays and consequently increased the cost of goods flowing through the country. The introduction of a value-added tax (VAT) in place of the cumbersome excise duty, state taxes and octroi (city taxes) regime is planned with a phased introduction from April 2005. It is expected to go a long way in ensuring better tax compliance, besides making indirect taxation uniform across the country. A key benefit expected from the introduction of VAT is that the tax-to-GDP ratio will improve substantially from the current dismal 9.5% (state taxes add another 6%). According to the recommendations of the task force on tax reform headed by the government’s chief economic adviser, Vijay Kelkar, the introduction of VAT will eliminate the revenue deficit by 2008-2009 and will increase GDP by 2%. These measures will be crucial for building GDP, but the government also has to drive forward other projects, such as building new highways linking the major urban centers and creating other physical infrastructure such as ports and airports, as well as increasing public spending on healthcare and education. Some other recommendations being made to the government involve increasing the flow of credit to the small and medium-size enterprise (SME) sector and providing stable electricity at a lower cost to industries, thus leading to larger investment demand.The investment rate in India stands at around 20%—lower than the savings rate of 24%.According to the Planning Commission (which designs, implements and monitors five-year public investment plans), India needs a 28% investment to GDP ratio in order to sustain growth rates at 8% per annum, so there is a substantial investment gap that needs to be filled. This is the minimum requirement for creating the environment for sustainable GDP growth and creating the right climate for domestic and foreign investment.The government also needs to ensure that people have the necessary spending power. Rural public works projects, major infrastructure projects, a stable tax regime and steadily increasing urban and rural incomes are providing the base for increasing consumer demand, which is a trigger for investment demand. “This year may not be great thanks to the drought, but if investors have a three- to five-year perspective, then things look good,”says Vyas. One common argument put forward as a stumbling block to foreign investment is the lack of labor reform, leading to lower foreign investor confidence. This could be a source of worry, considering that the biggest driver of FDI in India is labor outsourcing, whether it is in software services, auto components or textiles. But lack of labor reform or government willingness to consider allowing corporations the leeway to introduce a hire and fire policy is increasingly proving to be a non-issue.The reality is that Indian labor has proven itself to be very flexible.This fact has been demonstrated by events over the past few years. and successful voluntary retirement schemes abound both in corporate India as well as in the government sector. Over the past couple of years Tata Steel, the country’s largest private sector steel producer, reduced its workforce by more than 35%, from 78,000 to 50,000, while State Bank of India, India’s largest bank, reduced its workforce by 10%, or 23,500 employees, for example. The worries for FDI investors in reality are not so many, since most global corporations are looking for specific skills or niches within which they can operate.The story for portfolio investors is different because they have a shorter time frame so they will be more concerned about short-term changes. Softer issues such as law and order play an important part in increasing confidence levels of all investors both foreign and domestic and irrespective of their investment holding time frame. Political analysts and fund managers are unanimous that under the country’s new political masters, maintaining law and order will be a paramount concern and disturbances such as the communal flare-up witnessed a year ago in Gujarat will not recur. “The situation on the ground is getting better.The government, thanks to its social spending and various mega projects, is putting money into the hands of the population to spend,” says Vyas. People now increasingly have money to spend, and the law-and-order issues are being better appreciated. With so many changes already complete or under way, India probably already has the ingredients in place for making a lucrative investment pie that could whet the appetite of domestic and foreign investors.